Earn $7.49 in Rewards credit. Click to learn more. Aspiring roadies with large volume feet will rejoice at this wide version of the high-performance Shimano RC7 shoe. Borrowing from the top-end RC9, the SH-RC7E features a synthetic leather upper with Shimano Surround wrap technology combined with perforated dimple vents to give you a glove-like fit, and it's secured with hook-and-loop strap at the base and one BOA closure up top for precise tension adjustment that can be quickly changed on the fly. 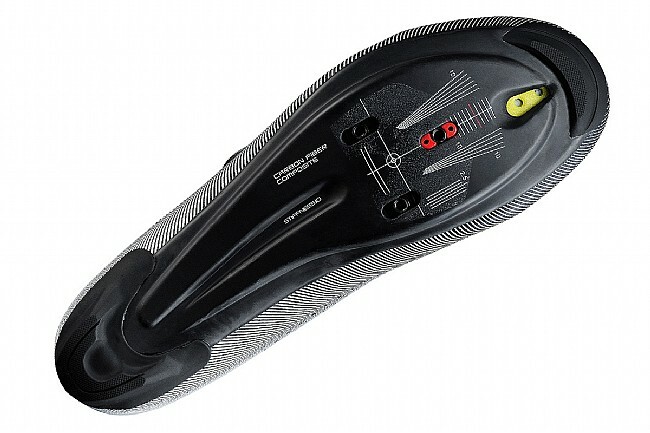 An ultra-rigid carbon midsole provides supreme power transfer, which you can take full advantage of thanks to Shimano's Dynalast shaping that facilitates a more efficient pedal stroke. Claimed weight is 245 g (size 42). Compatible with standard 3-bolt road cleats. A great option for a wide foot or high bridge. Wide cycling shoes dont populate most manufactures product list. That being said Shimano did a great designing a quality shoes ant a fair price point. The fit is as expected and they are great on the bike. I have been ridingracing Sidi Genius Mega wide (size 45) shoes for decades. 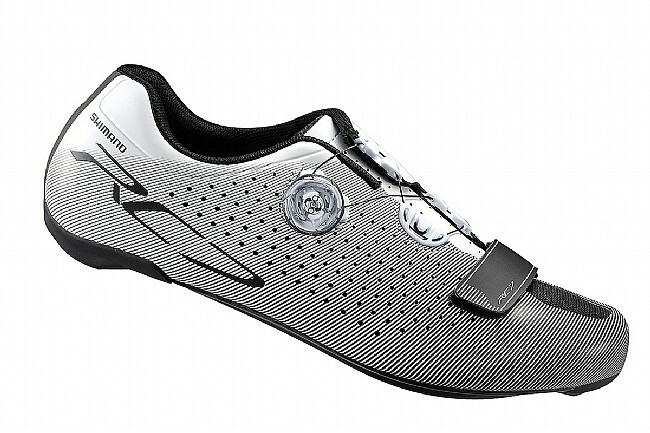 Opted for the Shimano RC7 wide shoe this time for light weight, BOA closure and carbon sole. The RC7s perform perfectly for me, exceeded my expectations, and have a roomy toe box to stuff a hand warmer in there on cold days. Thinking they would run a little larger than the SIdis, I first tried them in size 44 and they were too short and Western Bike Works quickly swapped them for size 45 and they have been perfect for several hundred miles of ridingracing. Wish they made their wide width shoes in half sizes. Love the lightness with great support. Hugs foot comfortably. These are the best fitting bike shoes I have used in my 12 years riding. The wide sizing meant that I could size down and still have enough toe box room. I have always worn shimano shoes but this is my first pair with boa. Time will tell how they holdup but so far I am loving the way they feel. Very nice looking riding shoe, which look great out of the box. Perfect summer shoe. Fit my foot really well. Downside is that the graphics start rubbing of the synthetic upper when you clip as you flick the pedal over to clip in. Excellent comfortable, stiff, lightweight shoe that Michael Jackson would love. I ride 250 miles per week and love how these Shimano shoes fit and perform. They are lightweight, transfer energy with minimum sole flex, and are even easy to keep clean. While the inner sole is very good, I always add a Specialized inner sole to add support and comfort. I would not hesitate to recommend these shoes. In fact when they recently went on sale, I purchased a second set for future use. Fantastic road shoe at a reasonable price. Immediate impact on my performance. This shoe has a design that seems to promote proper technique while maintaining comfort. My average speed has increased by 1 mph. Love the design, the uppers are a little hard at first, but after a few rides the shoe breaks in nicely. Maybe It's just me but Shimano cycling shoes just seem to fit. I never have a problem with them. These are light, stiff and not too pricey. I use them for road races, Crits and TTs. Good power transfer in all disciplines. Comfortable and stylish, too much volume in toe for my foot. I really like the shoe style, comfort, stiffness and price. The toe has too much volume for my foot . I will have to try alternative foot beds to get it just right. Super comfortable, stiff sole for max power transfer. Light weight for riding and racing. With Boa adjust while riding. Use it for my daily commute. Climbing has become easy with lot of power transfer. I have a very average foot and Shimano soes fit me real well, I've been happy with the shoe. I use this shoe for my triathlons that I do. I like the quick tightening and loosening feature of the Boa. I prefer this shoe over triathlon specific shoes because it is stiffer. The only very slight drawback that I have encountered is putting on rain, cold weather and aero booties. My booties fit quite tight and tend to pull up and release the Boa system when I'm putting the booties on and off. Amazing stiffness in the sole. Wonderfully made quality shoe. Is a real bargain in the mid $100 range. Unfortunately i had to return because they caused pain in my right foot. I typically wear a 10-10.5 EE shoe. Ordered these in a 45. Quite long but width was right on. I use these shoes on my racy road bike. My motivation to buy these shoes was out of a desire for comfort more so than stiffness. These shoes fit my wide feet well and allow me to ride comfortably for more than 3 hours. The stiffness is all there though! On my climbs I feel little to no flex and can take comfort in the fact that those watts are going straight to the rear wheel. In summary a stylish racing shoe with ample comfort for those of us with feet wider than a ballet dancer ( I have tried on multiple pairs of shoes from different makers, constantly disappointed in how narrow they make their shoes). Great shoes! Roomy toe box, lightweight, and stiff. These were my first Shimano road shoes, having previously ridden Specialized Elites and Audmax. The Shimano were a perfect fit right out of the box without any need for custom insoles. I was fortunate to get these on sale and couldn't be happier. I use Speedplay pedals so I did have to buy an adapter plate for the cleats, but not a big deal, though they will add about $35 to your ultimate cost. I wish Shimano would provide the adapter for Speedplay cleats with shoe purchase. Love these shoes. I usually wear a 43E and sometimes 43EEE. These shoes fit great. The toe box is roomy and the shoes are stiff, high quality, and the BOA enclosure is a dream.